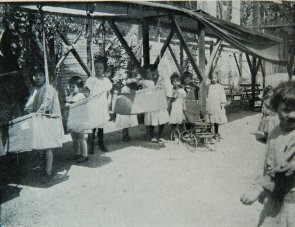 Children in "Babies' Rest Yard," with swinging cribs and baby carriages. College Settlement Association. "News of the College Settlement of Philadelphia." Vol. III, No. 8. Philadelphia: College Settlement Association of Philadelphia.